I went by plane via London og Sao Paolo. 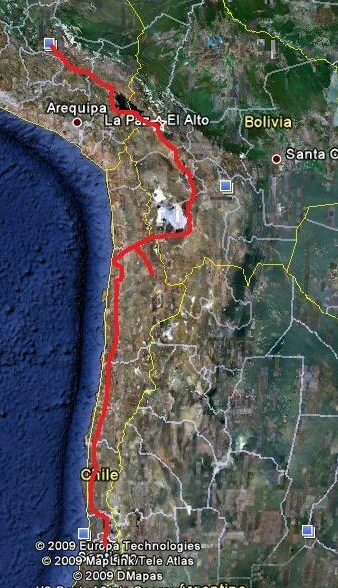 On bike from Santiago up north through Chile to Calama. From here by train to Uyuni in Bolivia. On bike further on to La Paz. From La Paz by bus to Copacabana and into Peru to Cusco and Macchu Picchu and back. At last an arranged mountain-bike tour down the worlds most dangerous road La Cumbre - Coroico and back. Plane to Copenhagen from La Paz. The journey lasted 2 months, july og august 2002.